Diesel price is now tracking February rates while petrol is at October 2017 levels. The pace of decrease of diesel price has been slower than that of petrol due to a difference in benchmark rates. New Delhi: Petrol and diesel prices, which had peaked on this day three months ago, have now fallen by about 20% while crude oil rates are down by nearly a third during the period. During the week, however, the crude oil rate has jumped 5% in volatile trading. After three days of unchanged pricing, state-run fuel retailers today decreased the price of petrol by 21 paise and diesel by 22 paise. A litre of petrol costs ₹ 68.44 in Delhi, ₹ 74.10 in Mumbai, ₹ 69.01 in Bengaluru, ₹ 71.01 in Chennai and ₹ 70.58 in Kolkata. Diesel, on the other hand, costs ₹ 62.44 a litre in Delhi, ₹ 65.34 in Mumbai, ₹ 62.80 in Bengaluru, ₹ 65.91 in Chennai and ₹ 64.21 in Kolkata. The price of dieselis now tracking February rates while petrol is at October 2017 levels. 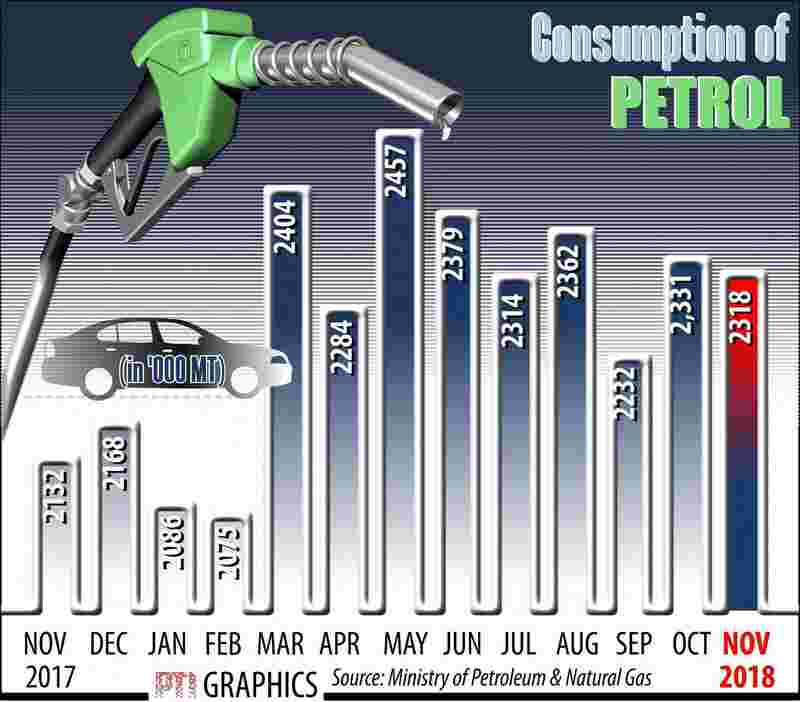 The pace of decrease of diesel price has been slower than that of petrol due to a difference in benchmark rates. Benchmark Brent crude oil, which had slumped close to $50 per barrel in December-end, has now recovered to $56 per barrel. Despite the global market turmoil, traders said oil prices were expected to receive some support as supply cuts announced late last year by the Organization of the Petroleum Exporting Countries (OPEC) started to kick in. Considering the planned cuts versus ongoing increases in US crude production, which hit a record 11.7 million barrels per day by late 2018, energy consultancy FGE said it expected Brent prices to range between $55-$60 per barrel in the first months of 2019.